Although I knew this could be an excellent chase day, especially to my north in central Illinois, my chasing opportunities were severely limited. Due to work, I could not get out until around 5:00 - by which time St. Louis city and county were under a tornado warning, and most of Illinois and eastern Missouri were under tornado watches. The cell responsible for the warning - the first in a lined-up group of 3 supercells in the St. Louis area - was crossing into Illinois just northwest of Edwardsville as I hurried home from work just before 5:00. In addition, severe thunderstorm warnings were out for Madison and southern Macoupin Counties based on both of the first two cells. 5:00 - Out the door. I grabbed my gear and headed up I-55 one exit to Hamel. 5:05 - Driving up I-55 toward Hamel, I could see rain/hail shafts and a brief lowering under updraft to my west. This was the second storm in the progression of 3 moving through the area. The first storm - the one that caused the earlier tornado warning in St. Louis Co., was to my north, to the north and, increasingly, northeast of Hamel. 5:15-5:20 - I exited the freeway and found a place to view the storm from 140 at the Hamel exit, just east of Hamel. Looking to my NNW through a little rain from second storm, I could see a wide but not particularly low wall cloud under updraft of the storm first storm, the precipitation core of which was now northeast of Hamel. 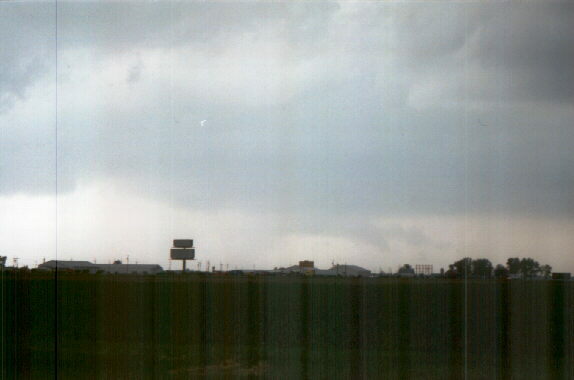 The wall cloud formed a long inflow tail on the side toward the storm's core, then the wall cloud rapidly lowered toward the ground. 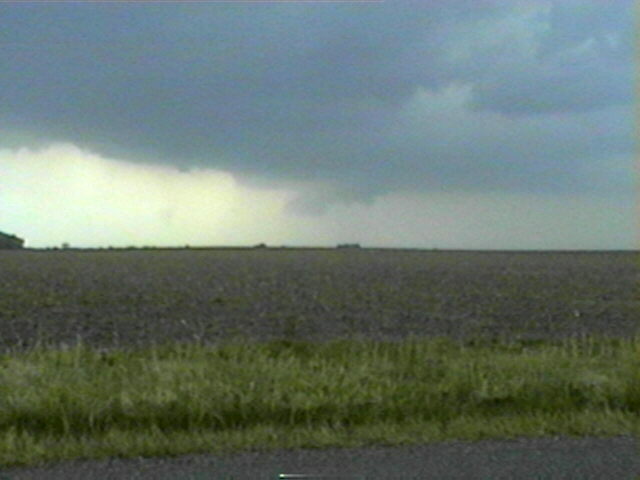 It quickly developed a nice RFD (rear flank downdraft) slot. 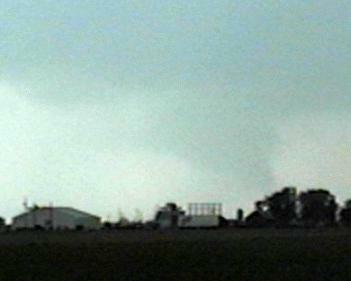 Here is a video capture which shows both the lowering and the RFD slot nicely. But due to rain falling from the next storm, I could not see if there was rotation, and trees kept me from seeing exactly how close it really was to the ground, though at this point it was down as far as I could see. It may have been a funnel cloud, but because I could not verify rotation I cannot say it was more than a very low wall cloud. 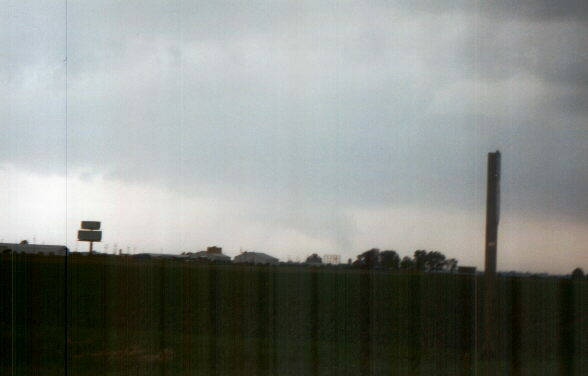 Additionally, the lowering seemed to form from or near the earlier inflow tail, which would argue against a funnel cloud. 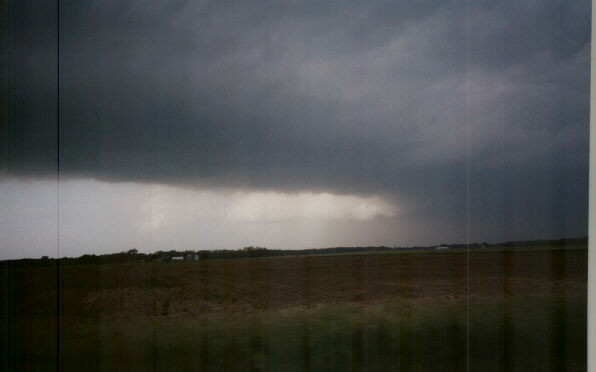 On the other hand, it rapidly lowered as the RFD slot cut around the wall cloud. I do not think it was a tornado, because there were no reports of tornadoes or of wind damage in that immediate area. In any case, it formed and dissipated within 5 minutes. Rain then obscured this area of the storm. 5:20 - 5:30 - As rain and maybe a little hail from the storm to the SW caught up to my position, I blast east on 140. Precip is coming from SSE. Then I turn S on 4 to get position on SW storm. I see RFB and intense precip core w/some hail shafts to my W and WNW; a very impressive rainfoot evident. I watched this from about 5:30 to 5:40. 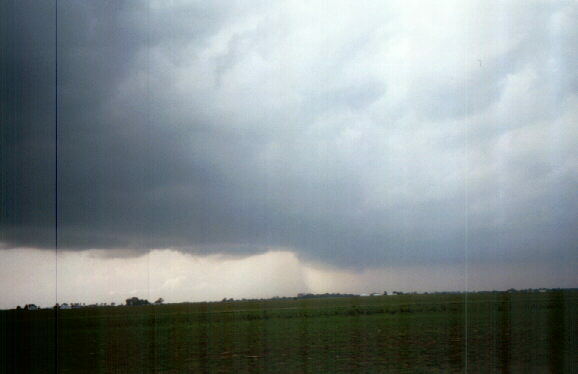 At that time, a small lowering - I thought outflow-related - forms on leading edge of storm S of heaviest precip. I followed the storm east on Fruit Road to where it T-intersects with Schwartz Rd. I took that a mile north to Niggle Rd. which I took east to 160. I cut north on 160 to 140 and followed 140 east until I reached the road S. to Pochahantas around or a little after 6:00. 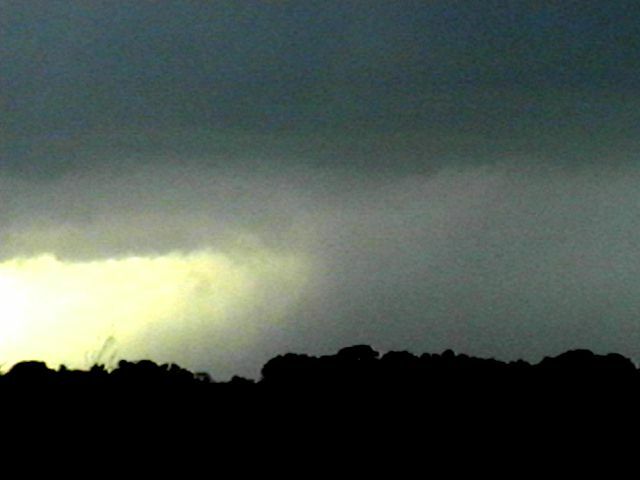 Between 5:40 and 6:00 the precip outran the lowering, which then took on a more wall-cloud looking structure. 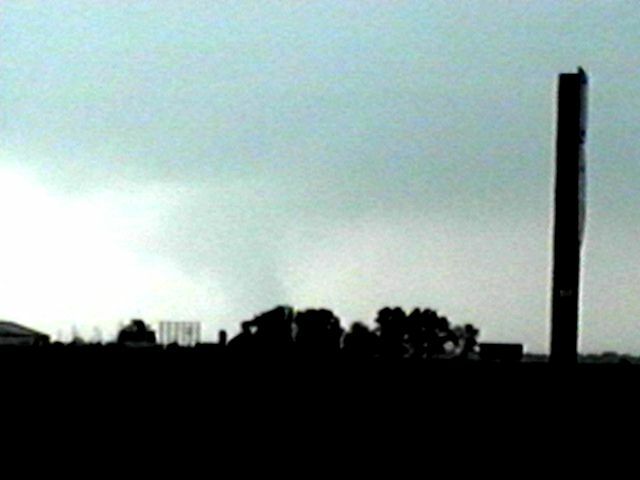 By now the lowering was under the updraft, which was very leaned over to NE (but it still had very hard towers) due to strong upper winds/speed shear. 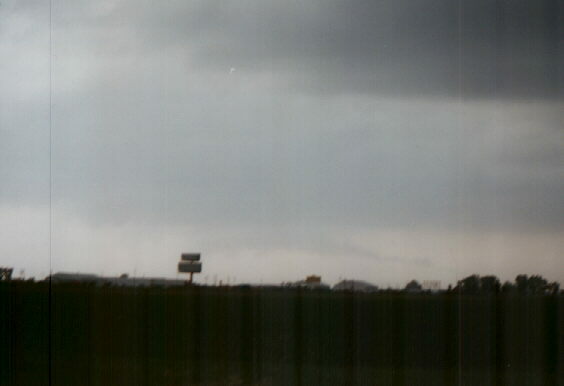 What appeared to be a hail shaft formed behind the wall cloud feature, which had become a little less pronounced by the time of this picture. (It would alternately increase and decrease in size from about 5:40 to nearly 6:00. Around 6:00 or a little before, an apparent clear slot, indicating the formation of a rear flank downdraft, cut around where the wall cloud had been, but around this time the wall cloud either disappeared in rain or dissipated, since all I could see where it had been was an area of precipitation. 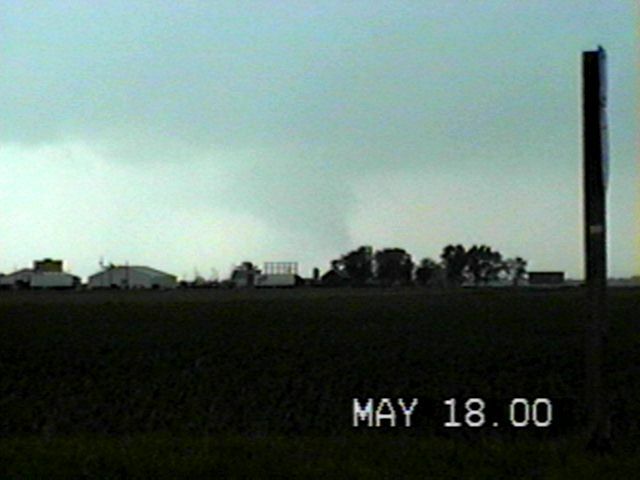 At this time, as had been the case for the entire chase, I was inflow to the storm - I was never overtaken by outflow, and at times the inflow was quite strong; I would estimate 30 mph or more at times. As it was now after 6:00 and the storm was still screaming off to ENE at 50+ MPH, I broke off the chase, in part for possibility of intercepting another storm with a warning in STL Co. (The third cell in the cluster) I proceeded W on I-70 then on IL-143. As it turns out, by 6:00 the whole complex of thunderstorms was dying out, as it apparently moved into more stable air or too far from the cold front. There were no tornadoes reported in the area, but scattered reports of large hail and straight-line wind damage in the STL area. I drove in sunshine and anvil rain from Marine back to Edwardsville. It appeared to rain out of a clear, blue sky, as the anvil from the southwesternmost of the 3 storms raced over me and off to my northeast in the jet stream winds. I was home by around 6:45. Total chase distance: about 65 miles. Below are a mesoscale discussion from SPC on these storms, the warnings on the storms, and the local storm reports from the St. Louis NWS. SPC MESOSCALE DISCUSSION #0832 FOR ..ERN MO/CENTRAL IL.. CONCERNING...SEVERE THUNDERSTORM POTENTIAL...REF WW 305. SEVERE STORMS WITH POTENTIAL FOR ISOLATED TORNADOES. OF EASTERN IL AND NORTHERN IND WITHIN THE NEXT 1-2 HOURS. THUNDERSTORM 7 MILES SOUTH OF BRUSSELS..MOVING NORTHEAST AT 25 MPH. MILES SOUTHEAST OF NEW MELLE...MOVING EAST AT 30 MPH. SEEK SHELTER IN A DITCH OR LOW SPOT. THUNDERSTORM 8 MILES WEST OF WALSHVILLE..MOVING EAST AT 35 MPH. THUNDERSTORM OVER WORDEN..MOVING EAST AT 45 MPH. THUNDERSTORM OVER NEW DOUGLAS. THIS STORM WAS MOVING EAST AT 40 MPH. COUNTY...SO THE WARNING HAS BEEN CANCELLED. LITTLE OR NO ADVANCE WARNING.